Lackey runner XV century. According to a colored print of 1567. Home » Lackey runner XV century. According to a colored print of 1567. Lackey runner 15th century. According to a colored print of 1567. 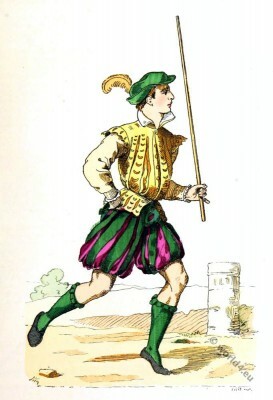 Laquais coureur au XV siècle. D’après une estampe coloriée de 1567. From the book: Costumes civils et militaires des Français à travers les siècles. 1883. Author: Jean Baptiste Marie Augustin Challamel. Engraver: Meunier, Jean-Baptiste. Ouvrage couronné par l’Académie francaise. Fashion under the Reigns of Louis XI., 1461 to 1515. German women`s costume history, 15th century. Italian 14th, 15th century fashion history. The Hennin. Headdresses history, 15th century. King Henry VI. and his court. The good duke Humphrey. Historia Scholastica. Medieval room interior, 15th century. The Lady of Tournament delivering the Price. This entry was posted in 15th Century, France, Renaissance and tagged Augustin Challamel, Renaissance fashion era on 5/23/15 by world4.